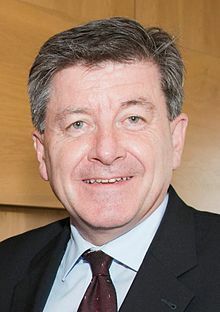 Guy Ryder CBE (born 3 January 1956) is a British political scientist and union organiser who is the tenth and current Director-General of the International Labour Organization (ILO). He was previously General Secretary of the International Trade Union Confederation (ITUC) (2006–2010) and previous to that position, Ryder was General Secretary of the International Confederation of Free Trade Unions (ICFTU) (2002–2006). Born in Liverpool in 1956, Ryder studied Social and Political Sciences at the University of Cambridge and then Latin American Studies at Liverpool. He speaks French and Spanish as well as his mother tongue, English. He started his professional career in 1981 as an assistant in the International Department of the Trades Union Congress in London. From 1985, Ryder held the position of Secretary of the Industry Trade Section of the International Federation of Commercial, Clerical, Professional and Technical Employees (FIET) in Geneva. In 1988, he became Assistant Director of the Geneva office of the International Confederation of Free Trade Unions (ICFTU), then in 1993 was appointed as its Director. Ryder first joined the International Labour Organization in 1998 as Director of its Bureau for Workers’ Activities and then in 1999 became Director of the Office of the Director-General. It was during this time that the ILO’s Decent Work Agenda was launched and won support from other international bodies. In 2002, Ryder was appointed as General Secretary of the International Confederation of Free Trade Unions (ICFTU), based in Brussels, where he led a process described as the global unification of the democratic international trade union movement. He also became a leading figure in the Global Call to Action Against Poverty (GCAP), for which he spoke at the 2005 World Summit. He was elected as first General Secretary of the International Trade Union Confederation (ITUC) when it was created in 2006 and headed its delegations to talks with the United Nations, IMF, World Bank, and World Trade Organization and to the G20 Leaders’ Summits. In September 2010, Ryder came back to the ILO in Geneva as an Executive Director, with responsibility for international labour standards and fundamental principles and rights at work. Among other activities, he supervised the application of ILO Conventions and Recommendations and headed ILO missions to address issues related to labour standards in several member countries, including Bahrain, Colombia, Fiji, Georgia, Greece, Myanmar, and Swaziland. Guy Ryder was elected as ILO Director-General by the ILO's Governing Body in May 2012 and took office on 1 October, 2012. On taking office, he pledged to position the Organization as a determined actor translating principle into action and ensuring that it had the capacity to make a major difference to the working lives of people on all of the continents. To support this he launched a major reform process geared to assuring the ILO’s authority on matters falling within its mandate. Ryder was appointed Commander of the Order of the British Empire (CBE) in the 2009 Birthday Honours. ^ "No. 59090". The London Gazette (Supplement). 13 June 2009. p. 8.